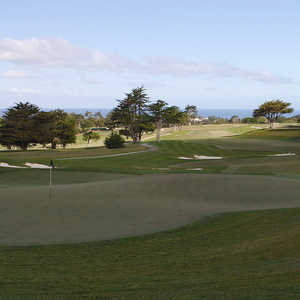 SEASIDE, Calif. - When playing Bayonet Golf Course, one is best equipped with a good game and a good attitude. At the point in the round where the game falters (it's when, not if) a positive attitude will carry golfers until the good shots find their way back. Bayonet's Web site only hints at the bigness of the place. A golf course on a very large scale, it's apparent from the moment you set foot on the first tee that you're some place special. Massive cypress trees form solid walls just off the edge of the fairways, creating eerie darkness when walking beneath them in search of errant shots (again, it's when, not if). The place has a U.S. Open feel to it - not surprising as it hosts qualifying rounds. Extraordinarily beautiful and painfully exacting, Bayonet will have you pulling out every single club and probably more often than you'd like. In a single world, Bayonet is macho. "I love it out here," said Gregg Thompson, a local who plays the course frequently. "It beats the heck out of me, but I just keep coming back for more." When asked how he describes the course to someone who knows nothing about it, Assistant Professional Tony Toliver said, "It's pain and agony. Come on out and play it, if you don't mind suffering." 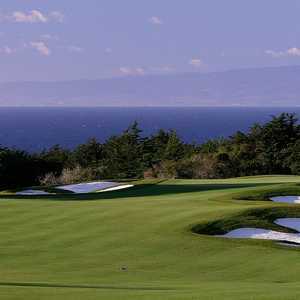 He adds Bayonet is rated as the most difficult course on the Monterey Peninsula - and certainly the most overlooked. 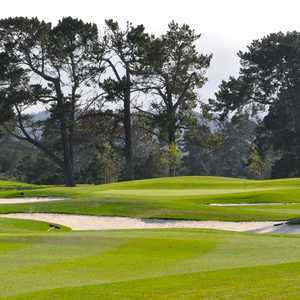 Though popular with locals, most visitors have never heard of it and likely won't during their visit to Monterey to play the high-dollar courses. Bayonet and its sister, Blackhorse, sit together on Fort Ord, a former military base. "A lot of people don't come out and play here because they think we're still military," Toliver said. Add to that its difficulty and it's easy to see why the hospitality folks don't urge corporate types and high handicappers to experience Bayonet for themselves. But skilled golfers can't get enough of it. Q-school goes through Bayonet. It has hosted Champions Tour and Nationwide Tour events. Ernie Els and Tiger Woods have both played several rounds. Are you picking up on a theme? This is big boy golf. You'll need driver to have a chance at handling the distance, but it's essential your drives be not only long, but straight. Beyond its sheer power as a stern test of the game, Bayonet has several other attributes. Course conditions are near perfect. Views of Monterey Bay and the surrounding hillsides are plentiful. Not a single home lines the course. The pace of play is brisk, usually no more than four and a half hours. Walking is permitted, for those who crave more punishment than just playing the course. It's a locals hangout, filled with friendly, knowledgeable people who can help you find restaurants and other places that aren't mentioned in the brochures. And the price is surprisingly low: never more than $75 and quite a bit less on weekdays in the afternoon. No. 1 is a beauty - a big, bold, undulating par 5 with fairway bunkers and an uphill approach to a large green. The fourth is a beast of a hole at 620 yards (playing slightly downhill) of a fairway seemingly long enough to comfortably handle the takeoff requirements of a Boeing 747. Jack Nicklaus has described it as the toughest par 5 in golf. No. 9 is a nice, long par 4 that plays uphill and will require a long iron or fairway metal on the approach. No. 11 is a superb risk-reward hole that asks golfers to either cut the corner of the dogleg or hit a big powerful draw. Those who choose to accept this mission and execute according to plan may get 30 extra yards of roll - a freebie nobody will pass up here. The back nine continues with a stretch of dogleg lefts. The designer, General Robert McClure was a lefty and apparently tended to slice - excuse me, "fade" his shots. Righties who slice will find additional reasons to wish to hurl clubs around at Bayonet. The 13th hole is a beast of a par 4, 450 yards into the wind. It's similar to the monster 12th hole at Torrey Pines South. The 17th hole is a long par 3 that plays significantly downhill, then the closer - in true Bayonet fashion - is a stout par 5 that bends to the right and mercifully opens up for the approach. The lounge awaits - you'll likely need it. There's a family-owned ski mountain in Vermont that's extremely popular with skilled local skiers. It's called Mad River Glen and the motto is "Ski It If You Can." Substitute the word "golf" for "ski," and you've got Bayonet Golf Course. If you're a good golfer you simply must play it. If your game isn't as sharp, but you have a good attitude and don't mind being a bit exposed, you also must play it. But if you get mad shooting high scores, or simply can't tolerate working so hard to make pars (and even bogeys), skip it. Maybe try Blackhorse (on the same grounds) or the nearby Del Monte or Laguna Seca. Both more golfer friendly. Green fees are $58 on weekdays and $75 on weekends. Twilight rates kick in at 2 p.m., with a super-twilight at 4 p.m., when rates drop to $25 on weekdays and $30 on weekends, cart included. The Portola Plaza Hotel (portolaplazahotel.com, (831) 649-4511), smack dab in the heart of downtown Monterey, has everything a golf traveler would need. There's a fitness center, a pool, and all the high-tech gadgetry a business type might need. It's centrally located, about 10 minutes from Bayonet, and offers plenty of other activities right outside the door. Fisherman's Wharf is a few steps away, as are numerous other restaurants, movie theaters, shops and galleries. The hotel has recently been renovated and has a contemporary feel. It's connected to the Monterey Convention Center and offers plenty of meeting space. Also try Marina Dunes Resort (marinadunes.com, (877) 944-3863) on Marina State Beach, even closer to Bayonet. Some of the rooms have ocean views. After the tough round at Bayonet, you'll need a pick-me-up. Try Tarpy's and Dishes Bistro and Grill ((831) 883-1207) in Marina. It specializes in California cuisine and seafood for dinner only. The dining facilities on the course are also well appointed with a diverse menu. I've had the good fortune to play both these wonderful courses. Bayonet about 25 years ago - it was agony but a lot of fun. If the layout hasn't changed, the fairway on the 620 yarder is very tight. Pebble is Pebble - played there in 2002. Hope to come back some day.